Seoulsome: Authentic Nepolitan Pizza @ The Kitchen Salvatore Cuomo, Seoul. The Kitchen Salvatore Cuomo opened a few years ago by Dosan Park near to Apgujeong. When it first opened it was instantly a hit and was always busy. A few years on and nothing has changed. The restaurant is bustling with people and the atmosphere is great. It's taken the place as my 'go to' Italian since, sadly, Antonio's in Cheongdam closed it's doors. This restaurant offers slightly more contemporary food choices in a bright, airy and youthful interior. I like it. A lot. Inside The Kitchen Salvatore Cuomo @ Apgujeong. My most recent visit was this last Saturday night. My boyfriend made us a reservation, which is a must on the weekend as the place gets packed with groups of friends and young trendy couples. Since the evenings are still fairly warm in Seoul right now we decided to make the most of it and dine on their lovely outdoor terrace which will probably be for the last time this year. It got pretty chilly towards the end of the evening. Outdoor seating area @ The Kitchen Salvatore Cuomo. After being promptly seated we selected a sparkling rose wine to drink and were brought their lovely homemade bread. It seems like my favorite restaurants always have one thing in common, they bring me something to nibble whist I make my dinner choices! Home-made focaccia bread. Breadsticks. Basil Pesto. Butter. The Panzerotti came as a complimentary dish with the bottle of wine we had chosen. We also ordered a salad to start. Prawn & Potato Salad. Sun-dried Cherry Tomatos. Artichoke. Crisp and fresh with great flavor. The salad was excellent, when it first arrived I had wondered where exactly the prawns were though. I was happy to find there were four or five very large plump prawns nestled in the salad along with plenty of potato and sun-dried tomatoes. It always annoys me when salads don't have enough of the good stuff and all your left with is the leaves. You know what I'm talking about, right?! For our main course we had selected Lobster Risotto with Lemon Zucchini which we hadn't tried before and a firm favorite of mine, a Proscuiotto and Rucolla Pizza. Main course - Pizza and Risotto @ The Kitchen Cuomo. The pizza here is one of the best I've come across in Seoul. It's actually authentic Neapolitan style pizza and that's not just my opinion! In Italy there is an association called the Associazione Verace Pizza Napoletana. This 'True Neapolitan Pizza Association' has set a specific set of rules for cooking pizza to enable it to be considered authentic Neapolitan pizza. The Kitchen Salvatore Cuomo is the first in Korea to be recognized by the AVPN and is the 300th restaurant in the world to serve true Neapolitan pizza. So there's a little factoid for you! The crust is doughy inside and crisp outside, it's got a lot of flavor too. The sauce they use for the base is fresh and light, they've kept the tastes in it simple which is great because it doesn't overpower the toppings. Lobster with Lemon & Zucchini risotto. I can't begin to convey how good the risotto was. Although the food is always good here I wasn't expecting anything 'wow' like this. Those moments are usually saved for the gourmet restaurants. The risotto had the perfect balance of creamy texture without the rice being too soft. It was jam packed with lobster, I had expected only to find tiny pieces every now and then but instead every mouthful had large chunks. The lemon and zucchini were a perfect pairing. Overall, the dinner was perfect. Not only is it the quality of the food that is excellent at this restaurant but their service is also some of the best I've received in Seoul. Our waiter was extremely attentive, without being intrusive. He managed to always top up our drinks before the glasses became empty and even moved an outdoor heater around to help keep us warm when the temperature dropped. Conveniently he spoke excellent English which helps to make the evening that bit more relaxing since you don't have to dredge your brain for a way to convey what you want in Korean! Satisfied and a little giddy after a delicious dinner and half a bottle of wine. Can't you tell? Now to give you an idea how much this yummy dinner will set you back. The price at The Kitchen is typical of high end eateries in Seoul but the food and atmosphere are what set it apart. This place provides truly high quality italian food, many of their ingredients are sourced from Italy, no rubbery mozzarella here! A pizza here starts at around 20,000 won and goes up to 28,000 won.The salad we chose was 16,000 won and the risotto 24,000 won. Our wine which came with the Panzerotti was 79,000 won. We were also offered a complimentary cheese plate after we'd finished eating to accompany our remaining glass. Sadly we were just too full to take them up on the offer. How to find The Kitchen Salvatore Cuomo. The restaurant is set behing Dosan Park in Apgujeong. If you don't already know the location then your best bet is to get in a taxi and provide them the address. 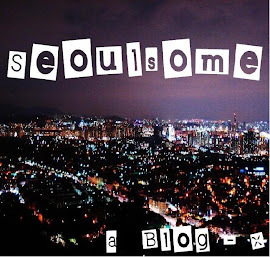 The nearest subway station is Apgujeong, take exit 2 and get in a taxi there.